A world of surprises in a book! Join Sal, Kim and the rest of the Espresso team as they explore the world’s yummiest substance. From Aztec rituals to the Bournville factory, and from cacao farming to Fairtrade marketing, find out everything there is to know about chocolate! Designed to get children speaking, thinking, investigating, writing and making things, this colour-drenched book is an absolute treat. 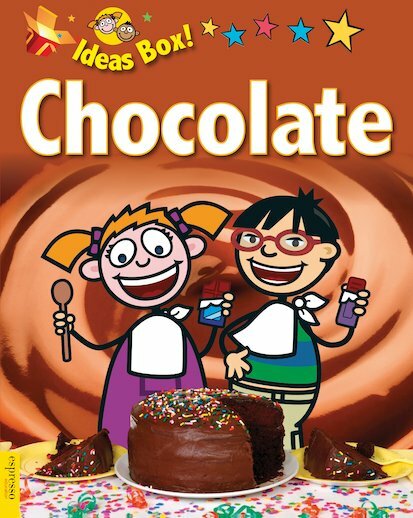 Inside, children can take quick quizzes, make an Aztec collage and a Mexican chocolate pinata, do a chocolate-melting experiment, bake chocolate cherry flapjacks and much more! Created to support cross-curricular study, this book includes recipes and activities, a glossary, an index and suggestions for further learning and discussion.